Everyone within the St. Columba’s College community would like to send their heartfelt congratulations to Old Columban Ian McKinley who made his international rugby debut with his newly adopted home Italy on Saturday. Ian was a star during his time at St. Columba’s, leading the Junior Cup Team to Duff Cup success and later the Senior Cup Team to McMullen Cup – they then went onto the semi-final of the Vinnie Murray Cup and the Leinster School Cup proper later in the same season). After leaving St. Columba’s Ian went on to represent Leinster and Ireland at U20 level, captaining the side during the Junior World Cup in Japan. Tragically, during a domestic game in 2010, Ian damaged his right eye but, amazingly, he returned to the field six months later. However, he subsequently lost the sight in the eye and was forced to retire from playing rugby. Ian spent some time coaching at St. Columba’s after his retirement until he was offered the opportunity to travel to northern Italy to coach at underage level there. Ian, along with his brother Philip, came across a new protective goggle and helped to get them recognised on a trial basis by World Rugby. He came out of retirement and began playing for his new club Leonorso Udine before joining the Italian side Viadana on a professional contract. His performances there caught the attention of Pro14 side Zebre who offered him a contract after some impressive cameos during international windows. Ian was instrumental in the goggles being recognised by all nations in the last few years allowing him to return to play on Irish soil and to also represent the Barbarians. Ian has since moved to Benetton Rugby (formerly known as Treviso) and his form this season and last – he is arguable Italy’s form out half – earned him the call up to Conor O’Shea’s Italy for their November test series. He was named on the bench to play Fiji on Saturday, coming on for the final 20 minutes and scoring a vital penalty. Italy won 19-10. 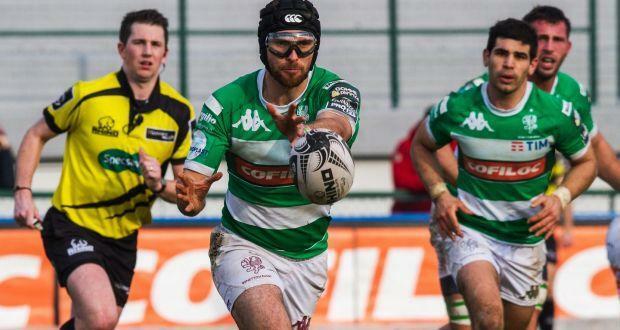 Ian was the first player to use in the goggles in the Pro14, the European Champions Cup and now at international level. Ian’s story is an inspirational tale of courage and persistence. We are immensely proud of him at St. Columba’s and sent him this video message at the weekend. We now hope he has a long international career ahead.